Our support team is ready to present you a new tutorial that will become an indispensable guide on removing admin bar when viewing the website. WordPress automatically displays an admin toolbar at the top of the page for the logged in users. We are glad to show you how to remove this admin bar. 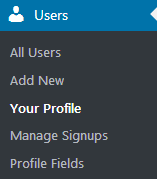 Log into your WordPress Dashboard and open Users >Your profile section. Uncheck Show Toolbar when viewing site option under the Toolbar. The toolbar will not be displayed on the frontend of your site, but it will still be available on the backend. We recommend that you leave the backend toolbar as it is – it contains important information about your site, after all. That’s all, now you know how to remove the admin bar when viewing your website. This tutorial is based on Emanuella Dance School Responsive WordPress theme.